ALavandhAr concludes explaining the supremacy of bhagavAn through logic and reasoning which are favourable to pramANam (SAsthram, authentic scriptures). kasya udharE – (subdued) in whose stomach? ka: rakshathi – who is protecting? ajanishta – (this world) was created? puna: udhgirathi – and spat out again? Sakya Sanka: – can there even be a doubt? kasyOdharE hara virinchi mukha: prapancha: – In whom, all creatures starting with brahmA, Siva were subdued during the total deluge? As said in chAndhOgya upanishath 6.2.1 “sadhEva sOmya idhamagra ASIdhEkamEva adhvithIyam” (Dear child! this world (which is seen with many names and forms), during total deluge remained as brahmam which is none as sath as one entity (due to lack of names and forms), without a second (since there is none like that), remained for dhvi parArdha kAlam (100 years of brahmA’s life) without names and forms, and becomes subdued in sarvESvaran as said in subAla upanishath 2 “thama: parE dhEva EkIbhavathi” (mUla prakruthi (primordial matter) named thamas, became subdued in sarvESvaran). As said in mahAbhAratham SAnthi parvam 210.24 “brahmAdhishu pralinEshu nashtE lOkE charAcharE | AbhUthasamplavE prApthE praleenE prakruthau mahAn || Ekas thishtathi viSvAthmA sa thu nArAyaNa: prabhu: ||” (When brahmA et al all are destroyed, the movable and immovable entities of the world become destroyed, five great elements are finished and mahath (the great element) becomes subdued in to mUla prakruthi (primordial matter), only the one who is the sarvAntharyAmi (in-dwelling super soul of all) remains. He is nArAyaNa, the sarvaswAmi (lord of all)), when it comes to working based on karma, there is no difference between [great personalities] brahmA et al and [minute entities] ant etc. kO rakshyathi – Who is protecting the world which contains rudhra, brahmA et al? SrI vishNu purANam 1.22.21 “na hi pAlana sAmarthyamruthE sarvESvaram harim | …” (Oh wise person! Except for hari who is well situated in sustaining others, no one has the ability to give protection), para samhithA “na sampadhAm samAhArE vipadhAm vinivarthanE | …” (I have not seen any one other than purushOththama who is capable of bestowing wealth and removing the dangers without a trace). ajanishta cha kasya nAbhE: – From whose stomach, the unmanifested universes came into existence? In mAhAbhAratham, in relation to mArkaNdEya rishi “srujathas thasya dhEvasya padhmam sUryasamaprabham | nAbhEr vinissrutham thasya thathrOthpanna: pithAmaha: ||” (When that lord started creating, a lotus shining like sun arose from his navel and brahmA appeared in that lotus), mahAbhAratham “yaththath padhmamabhUth pUrvam thathra brahmA vyajAyatha | brahmaNaSchApi sambhUthaS Siva ithyavadhAryathAm || SivAth skandhas sambabhUva Ethath srushti chathustayam ||” (From the lotus flower which appeared from bhagavAn‘s navel, brahmA was born. It should be known that Siva was born from brahmA. From Siva, skandha was born. These are the four stages of creation in the beginning) and so on. krAnthvA – Who placed his feet on everyone starting from brahmA upto a blade of grass? ALavandhAr asks if the one who placed the divine feet is the lord or the one whose head was trampled is the lord? 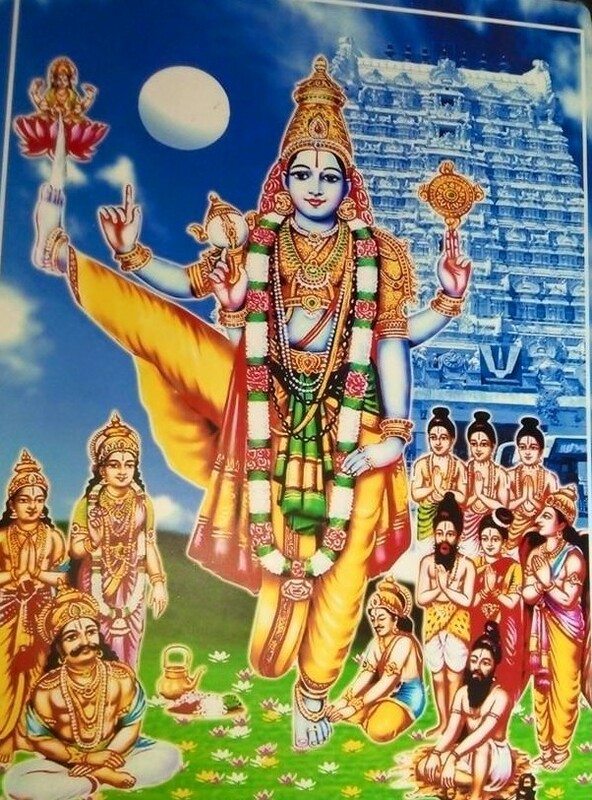 vishNu dharmam mAngaLyasthavam “sangais surANAm …” (Let that hari who placed his feet over the dhEvathAs, humans et al, be with me to bring all auspiciousness to me) . nigIrya punarudhgirathi – [spitting out again] during intermediary deluges. thvadhanya: ka: – Who else is the wholesome protector other than you? kEna vaisha paravAn ithi SakyaSanka: – Is there still doubt that there is some other person who is lording over? As said in “sandhigdhE kalu nyAya: pravarthathE” (Only in doubtful matters, one can try to apply logic to clarify the doubt) – there is no question of doubting some one else to be supreme. One is the creator, other is the created; one is the lord, other is servant; one is Sriya:pathi (lord of SrImahAlakshmi), other is umApathi (lord of pArvathi); one is puNdarIkAksha (lotus-eyed), other is virUpAksha (with unusual (three) eyes); one is garudavAhanan (who rides garuda), other is vrushabhvAhanan (who rides a bull); one is sinner (rudhra with kapAla attached to his hand), other is purifier (vishNu who relieved rudhra from his sin); one is purushOththama (supreme purusha – lord), other is purusha (jIvAthmA); one (rudhra) beholds the lotus feet on his head, other (vishNu) being the owner of those lotus feet ; one is worshipped by nithyasUris (eternally free souls), other is worshipped by vEthALas (ghosts); in this manner when there is so much difference between rudhra and vishNu like darkness and light respectively, and since rudhra is one among us jIvAthmAs, there is no question of doubting him to be the supreme; same rule applies to brahmA also and thus he too cannot be considered as the supreme. This entry was posted in Other, sthOthra rathnam on December 27, 2016 by Sarathy Thothathri.